It is recommended that when installing more than 1 System component You do each separately. 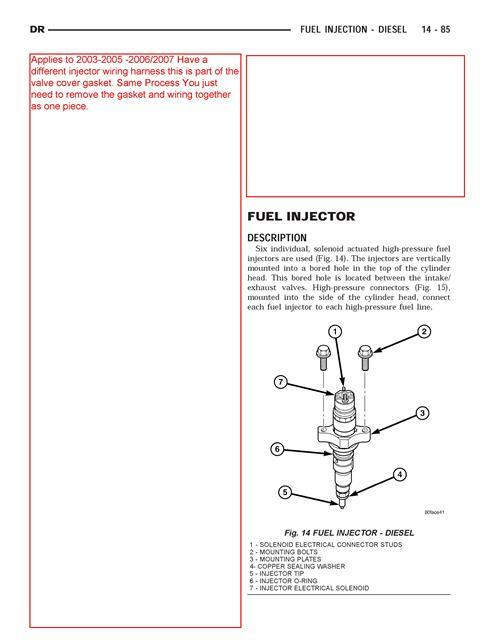 Example Injectors and Pump: Install whatever you believe to be causing the Problem first, then start and run the truck to see if problem is solved, then move on to the next component. The reason behind this it makes trouble shooting simple and saves time. There are six individual solenoid actuated high-pressure fuel injectors. The injectors are vertically mounted into a bored hole in the top of the cylinder head. This bored hole is located between the intake/exhaust valves. High-pressure connectors mounted into the side of the cylinder head. 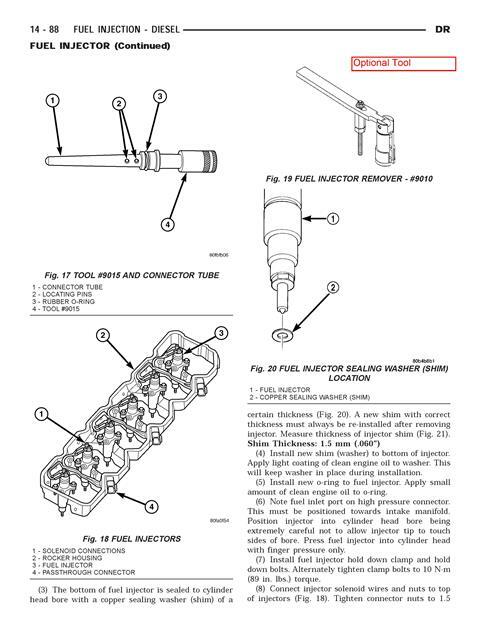 connect each fuel injector to each high-pressure fuel line. (1) Disconnect negative battery cables from both batteries.Cover and isolate ends of cables. (4) Remove high-pressure fuel line connecting fuel injector rail to high-pressure connector. (5) A connector retainer nut is used on each connector tube.Remove this by unthreading from cylinder head. (6) Using special high-pressure connector removal tool (#9015 Optional,Just use one of the lines to remove tubes ), remove necessary high-pressure connectors from cylinder head. Tool #9015 threads onto connector tube.Use tool to pry connector tube from cylinder head. These should be removable by hand. (7) Remove necessary exhaust rocker arm assemblies.Keep these in order. (8) Disconnect injector solenoid wire nuts at top of injectors. 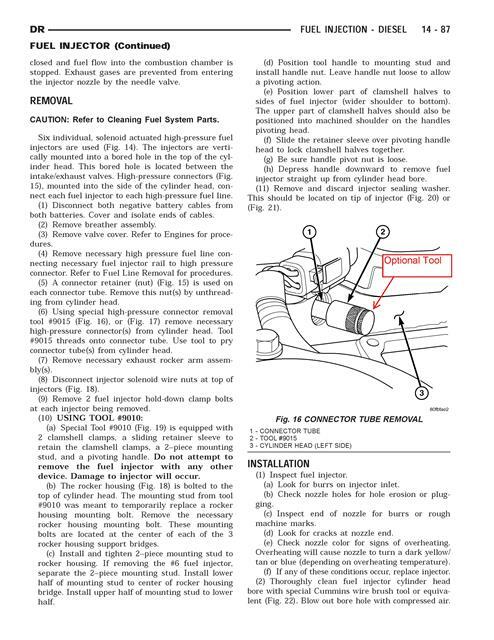 a: Remove two fuel injector hold-down clamp bolts at each injector being removed. b: The rocker housing is bolted to the top of the cylinder head. The mounting stud from tool #9010 was meant to temporarily replace a rocker housing mounting bolt.These mounting bolts are located at the center of each of the 3 rocker housing support bridges. c: Install and tighten 2-piece mounting stud to rocker housing. If removing the #6 fuel injector, separate the 2-piece mounting stud.Install lower half of mounting stud to center of rocker housing bridge.Install upper half of mounting stud to lower half. d: Position tool handle to mounting stud and install handle nut. Leave handle nut loose to allow a pivoting action. e: Position lower part of clamshell halves to side of fuel injector (widershoulder to bottom). The upper part of clamshell halves should also be positioned into machined shoulder on the handles pivoting head. f: Slide the retainer sleeve over the pivoting handle head to lock clamshell halves together. h: Depress handle downward to remove fuel injector straight up from cylinder head bore. a: Look for burrs on injector inlet. b: Check nozzle holes for hole erosion or plugging. c: Inspect end of nozzle for burrs or rough machine marks. d: Look for cracks at nozzle end. d: If any of these conditions occur, replace injector. (2) Thoroughly clean fuel injector cylinder head bore.Blow out bore hole with compressed air. (4) Install new shim (washer) to bottom of injector.Apply light coating of clean engine oil to washer. This will keep washer in place during installation. (5) Install new o-ring to fuel injector.Apply small amount of clean engine oil to o-ring. (6) Install injector into cylinder head with male connector port facing the intake manifold. Push down on fuel injector mounting flange to engage o-ring and seat injector. 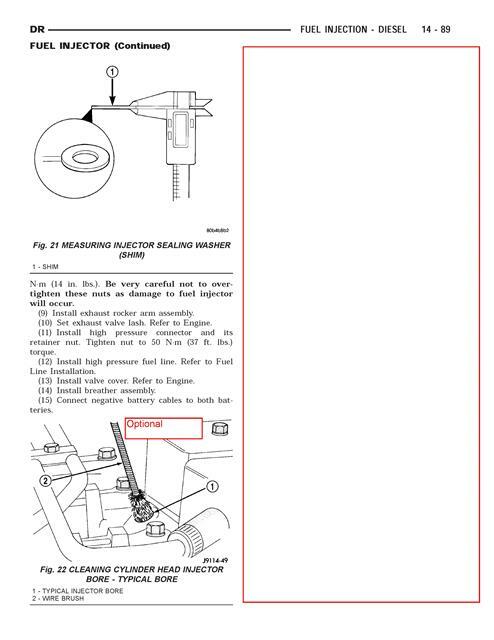 a: Install fuel injector hold down clamp (mounting flange) bolts.Do a preliminary tightening of these bolts to 44 in. lbs. torque. This preliminary tightening insures the fuel injector is seated and centered. b: After tightening, relieve bolt torque, but leave both bolts threaded in place. c: Install high-pressure connector and retaining nut.Do a preliminary tightening to 11 ft. lbs. torque. d: Alternately tighten injector hold down bolts to89 in. lbs. torque. e: Do a final tightening of the high pressure connector and retaining nut.Tighten to 44 ft. lbs. torque. (8) Connect injector solenoid wires and nuts to top of injectors. Tighten connector nuts to 11 in. lbs. torque. Be very careful not to over tighten these nuts as damage to fuel injector will occur. (9) Install exhaust rocker arm assembly (27 ft. lbs.). 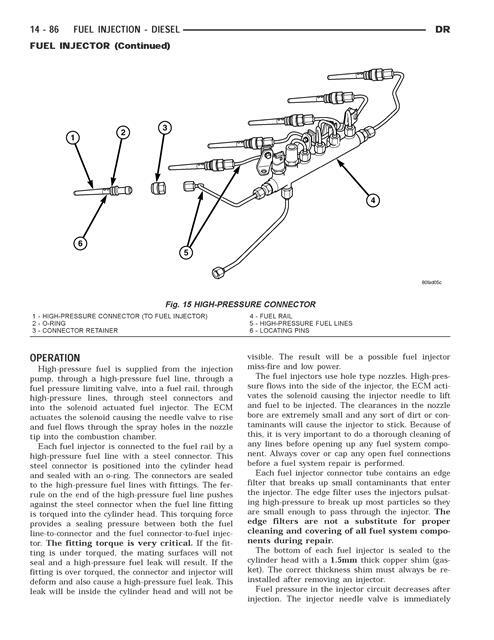 (11) Install high-pressure fuel line. Refer to torque specifications. Be sure to use a secondary back-up wrench on the connector nut while torquing fuel linefitting. (12) Connect negative battery cables to both batteries.